At the end of the year it is customary to look back and sum up the events of the last 12 months. We will also try summing up the year linguistically. Which new words and phrases has 2014 brought to life in Russia? By which expressions will it be remembered? On the Facebook social network there is a group called "Slovar Goda" (“Dictionary of the Year”). For the last three years, every month the participants of the group (of which there are more than 500) have collaborated to create a list of the most relevant words that have come to social prominence over the previous 30 days. The year was dominated by events in Ukraine, which is why the 2014 Slovar Goda includes several geographical terms: ‘Crimea’ (which held a referendum on independence in March), ‘Odessa’ (which on May 2 witnessed tragic events with numerous victims) and ‘Novorossiya’ (a historical name for the south-eastern regions of Ukraine dating back to the 18th century, when the lands were actively settled by Russia after being won from the Turks). The most noticeable derivative from the geographical name is the expression "Krym nash" (“Crimea is ours”), inspired by Russia's annexation of Crimea in March. Soon the two words joined and became a meme, which entered the Slovar Goda in April as "krymnash." The expression "Krym nash" implies the speaker's positive evaluation of this event, whereas "krymnash" has an ironic connotation and is used by those opposed to Crimea's annexation. 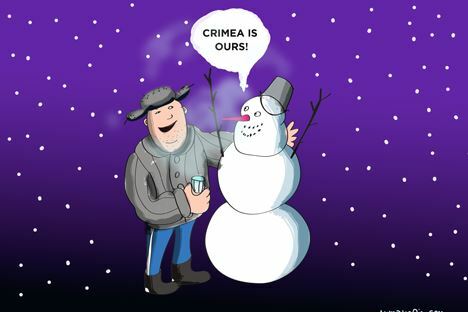 Those who think that annexing Crimea was a mistake very often use the sarcastic expression: "Prices are rising, but Crimea is ours" or "There's a crisis in the country, but Crimea is ours." Therefore, the word "krymnash" has become a negative label for those who are happy about the event. Today it is possible to hear phrases such as "He's a krymnash" or "Those guys over there are krymnashers." In general, the appearance of offensive and derogatory labels is one of the sadder trends of 2014. Last winter Ukrainian opposition members were derided as "Banderovtsy" (after Stepan Bandera, a Ukrainian nationalist leader who fought against the Soviet Union during WWII), whereas the Russian opposition, starting in March, has been referred to as "national betrayers" and "the fifth column." In the spring, the militias in southeastern Ukraine acquired the nickname "separatists" and “vatniky.” A vatnik is an article of winter attire, a quilted wadded jacket that is good protection from the cold. It is not very attractive ─ it is worn for its warmth, not its beauty. That is why the word vatnik, in its broader sense, is now used to describe a narrow-minded, uneducated and uncultivated tough guy. Opponents of the “vatniky” believe that this is the class that prevails among the population of eastern Ukraine. There is also a counter trend that concerns euphemisms ─ externally neutral expressions that conceal the potentially conflictive character of the corresponding situation. For example, the official Russian troops present in Crimea were called a "limited contingent" and "little green people" (according to the color of their uniforms). The ironic term "polite people" (that is, soldiers who are not aggressive, who do not open fire in order to achieve their objectives) later acquired particular popularity among Russians. The sanctions (another popular word in 2014) introduced against Russia led to retaliatory steps in the form of restrictions on the import of food products from European Union countries. As a consequence, words like ‘parmesan’ and ‘jamon’ made it to the list. The names of these products, which have disappeared from supermarket shelves, have come to symbolize the restrictions that first and foremost affected the Russian middle class. This segment of the population had just become used to ‘elitist’ consumption. Each year usually brings to Russia several new foreign loan words or expressions. A couple of years ago the English word of the year was ‘selfie’ ─ a self-portrait taken with a mobile phone and then posted on social networks. In 2014 this word became part of the Russian language, while the attempt to translate and Russify it as sebyashka was a failure. Another word, which refers to the distortion of information and the manipulation of public opinion, and which has become the undisputed leader among new words in 2014, is ‘fake’ ─ the direct calque from the English, something that is counterfeit, false, fictitious, bogus. Information announcements and TV features that were supposed to demonstrate the validity of certain events often did not correspond to reality. Primarily these dealt with ‘shedding light’ on various episodes of the Ukrainian conflict. The genre of consciously provocative fakes became very common. A typical ‘fake’ includes information that is initially based on facts (and therefore evoking belief), but which is then intentionally distorted to an absurd level, thus leaving the audience in a condition to believe any lie. It is the word ‘fake’ that may, unfortunately, serve as a kind of symbol for 2014.